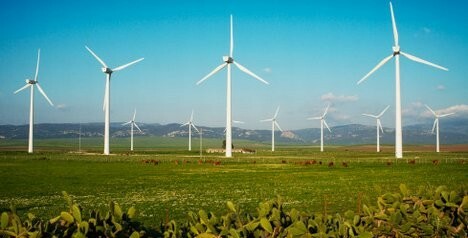 The south-central coastal province of Ninh Thuan has given approval in principle for Vietnam Electricity Investment and Construction Joint Stock Company (EVNIC) to deploy a wind power project using Russian technology with total designed capacity of 40.5 MW, Pham Hong Giang, general director of EVNIC, said. The first phase of the Cong Hai wind power project will be carried out this year on 20 hectares in Cong Hai Commune in Thuan Bac District. With three turbines having a designed capacity of 1 MW each based on Russian technology, it is expected to turn out about 14 million kWh of electricity annually. The second phase, meanwhile, will be developed from 2014 to 2015 on 160 hectares with 15 turbines with a designed capacity of 2.5 MW each using U.S. technology. Equipment imports from the U.S. for the phase now are being assessed by the General Department of Energy under the Ministry of Industry and Trade. Every MW of the project costs an estimated US$3.2 million in investment. In the planning, “Wind energy planning for power generation in Vietnam’s coastal provinces”, Ninh Thuan is considered a high-potential region for wind power development with total exploitation capacity of 2,000 MW by 2020. A number of areas with strong wind sources in Ninh Thuan are Ninh Phuoc, Thuan Nam, Thuan Bac and Ninh Hai districts. Some 14 wind farm projects have been given approval in principle by the local government to make surveys and prepare investment plans. Specifically, there are 12 small areas with wind power exploitation potential in Ninh Phuoc District with total designed capacity of up to 735 MW. This is also an ideal region to construct a wind power center and many investors now are studying related schemes there. The neighboring province of Binh Thuan is also a good region for wind power development with total capacity of up to around 5,000 MW. The provincial authorities have already allowed investors to deploy 12 wind power schemes, with two already in operation with total designed capacity of 30 MW. The wind power price paid by Vietnam Electricity Group is set at 7.8 U.S. cents per kWh. The country’s wind power potential to be exploited in the next few years is 6,500 MW, Nguyen Anh Tuan, deputy director of the Vietnam Institute of Energy, told the Daily on Monday. However, only three wind farm projects have connected with the national power network with a combined capacity of around 120 MW, he said, adding 40 other schemes are still under consideration for investment approval. Six more hydropower generators with total capacity of 213.5 MW are scheduled to start operation this month, according to the Ministry of Industry and Trade. They include the second generator of Khe Bo hydropower plant, whose capacity is 30 MW, and the first generators of Song Bac, Ta Thang, Van Chan, Dam Bri and Dong Nai 2 plants, with a respective capacity of 42 MW, 30 MW, 19 MW, 37.5 MW and 35 MW. Total power consumption this month is estimated at nearly 11.9 billion kWh, up 11.6% over the same period last year. There will be no power cuts this month if there are no major incidents at power plants and the 500-200 kV transmission lines and power demand do not increase suddenly, said the trade ministry. Still, it will be hard to ensure sufficient power supply to the southern region because gas supply from Ca Mau Gas Complex will be disrupted in the middle of this month for periodical repair and maintenance. In addition, power production at the hydropower facilities in the south may be limited since the water levels of many reservoirs have significantly fallen, said the ministry.